Plus, Silvia Anastasi gets a proper introduction. 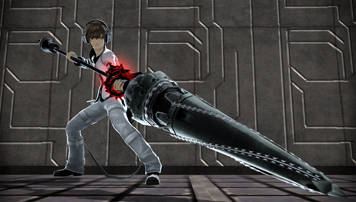 A new trailer for Freedom Wars released today introduces the game’s six weapon categories, as well as some of the weapons within them. But first, some new information! Weapons will have different levels of rarity. There are also differences in the basic performance of weapons in the same rarity. Some of them have a special “Modular” effect, as well. There are a total of six weapon categories. Attack motion differs depending on the “series” of weapon. In addition to using the two weapons equipped, players can also make use of weapons dropped by enemies. There are a series of attacks where you wield a spear. During a light long sword charge, you can change up the direction of your attack. Larger hammer-type weapons are also present in the large sword category. Gatling guns, laser guns, and net guns are also present in the squad support firearms category. Small Sword – You can let out a series of consecutive attacks with little room from enemy attacks. It also has a fuse function that dislocates joints. Large Sword – The gap for enemy attacks is big. Both light and heavy attacks can be carried out via a charge technique. Long swords are also in this category. Spear – Attacks from both the front and back are possible. There is a light charge attack, too. When in a critical state, your attack power will increase. Personal Carrying Firearms – Through compact firearms, rapid fire is possible. It is also possible to attack with a firearm while using the thorny whip. Multipurpose Firearms – These have better steam power, but lower capacity. Squad Support Firearms – Excellent attack and defense ability, but like multipurpose firearms, low capacity and mobility. Additionally, we also have more details on Silvia Anastasi. She is the elder sister of Beatrice, and a commanding officer of the anti-ground troops of Divine Punishment. She’s generally quiet, but is militant on the battlefield. During a certain mission, you’ll follow her, who disappeared from Divine Punishment back down to the earth. Watch the video below. Freedom Wars is due out for PS Vita in Japan on June 26, with a North American and European release also planned.